First, governments blocked Blogspot. Then they blocked Facebook, and then Twitter. And just when technophiles all over the globe started groaning, a couple of governments got a bit wiser to social media and, rather than block the entire platform for the transgressions of one user, began blocking individual accounts instead. Notably, this has happened in the past with YouTube where, rather than cut off the video-sharing site for all users, a government will simply block a single video; the latest trend seems to be blocking individual Twitter pages. Over the past few weeks, reports have trickled in to Herdict and via Twitter, alerting us of the filtering of individual Twitter pages in Tunisia and Bahrain (as well as, possibly, China). In Tunisia, the accounts of exiled activist Sami Ben Gharbia (@ifikra), engineer @Ma7moud, and popular independent news source Nawaat (@nawaat) have been confirmed inaccessible, while in Bahrain @FreeBahrain was allegedly blocked on New Year's Day. Twitter is no stranger to being blocked: Both China and Iran have blocked the social networking/microblogging site in the past, and Saudi Arabia reportedly blocked two individual Twitter users' pages in mid-2009. 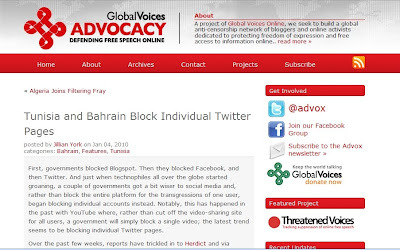 What is particularly interesting is that the governments of Tunisia and Bahrain have now demonstrated capability and desire to block individual Twitter pages, thus silencing certain voices while still keeping a major communication platform open. Only time will tell if this will become a global trend. SOMETIMES IN LIFE YOU FEEL THE FIGHT IS OVER . Tunisia: They censored Arabicca Again !